The wonderful works of art by Simon Marmion, Gerard David, Simon Bening,the Master of Prayer Books of around 1500, the Master of the Houghton Miniatures, the Master of Dresden Prayer Book, the Vienna Master of Mary of Burgundy, the Master of James IV of Scotland. Between about 1470 and 1560, Flemish manuscripts‘ painters created, on the pages of illuminated books, some of the most stunning works of art of the Renaissance. 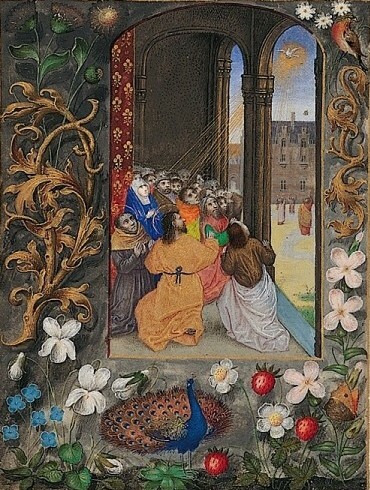 During this period manuscript illuminators radically transformed the appearance of the illustrated page. First, they introduces into their miniatures the mastery of light, texture, and space that Jan van Eyck (1390- 1441) and Rogier van der Weyden (ca. 1400-1464) had achieved in their devotional images, altarpieces, and portraits painted in oil on panel. Indeed, the finest of the new generation of illuminators rivaled the painters in the expressiveness and subtely of their best miniatures. Second, the decorated border of the page, the area that surrounds a painted image or text, grew comparable in its richness to the miniature it framed. Superseding the two dimensional border concept of the past, the faming flora and fauna were more three-dimensional and closer to actual size. Flowers and insects cast their own painted shadows, teasing the eye with their apparent veracity.